Back Office Pro (BOP) understands the need of being flawless in presenting the final wedding video to capture a couple’s nuptial celebrations as natural and detail as possible. Being an outsourcing destination, BOP offers best in class wedding video editing services to help wedding planners and video editing agencies in their wedding video editing process during resource and time crunch. With a team of skilled wedding video editors and animators, BOP boasts the wedding service providers with experienced resources, software-knowledge, and infrastructure required for in time delivery of quality wedding albums. The scalability of our editing teams enables wedding video editing companies in providing quicker delivery by paying for only the work hours and the precise number of editors they use for their projects. 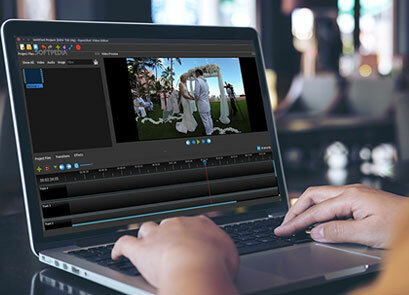 Back Office Pro’s wedding video editing experts use the best available software and techniques to deliver the highest quality, movie-like wedding videos. For outsourcing wedding video editing services, our video editors make use of visual effects, animation, and filters to enhance the footage while compensating for errors and inconsistencies in filming. Above five years of experience in video editing and post-production work. Experienced in handling shooting issues such as shaky camerawork, blurriness, lighting inconsistencies and setup errors. Working experience in Adobe After Effects, Adobe Premiere Pro, Adobe Photoshop, Final Cut Pro, Adobe Illustrator, Pinnacle Studio, Sony Vegas Pro, and Camtasia Studio, etc. Expert in 360 panorama, stop motion, 360 videos, etc. Specialized in synchronizing footage captured across multiple devices to secure the desired angles are achieved, and each shot is blended into a cohesive end-product. Skilled in analysis and correction of inconsistencies between the various sources of video, resulting in a final high-end product. Well-versed in theme integration and separation of video elements into subcategories, including color schemes, event-based graphics, and personalization. Experienced working with a wide range of wedding video styles and versions including spoilers, highlights, previews and extended ceremony and reception videos, and snapshot reels. Our team sifts through your raw footage to pinpoint key moments, along with personalized transitions, audio, and storylines. These videos are short, catchy, and are perfect for social media sharing. We can blend and correct the variations in lighting between clips and video sources, as well as adaptation to changing light conditions. We ensure smooth synchronization by making use of multi-cam editing that also adds cinematic appeal. Making use of cropping allows our team to remove excess content or noise from video clips to ensure that only the desired portions of each segment are captured. Back Office Pro’s team is capable of producing immersive time-lapse videos to deliver a personalized feeling to the production. The use of action cameras has grown in popularity in the pursuit of enhanced personalization. The fixed-mounted or mobile versatility of these cameras opens them up to use as primary recording equipment for the wedding, or simply as supplementary footage. Our team excels in creating punchy, relatable videos and time-lapse sequences. Destination weddings have grown in popularity, leading to a rise in the amount of aerial footage being filmed. Back Office Pro has experience with the editing of drone footage and its integration into the storyline of the video, creating an immersive experience to be enjoyed long after the wedding is over. Guests’ greetings and compliments are recorded in either a physical booth or in a virtual space to convey personalized thoughts and emotions to the newlyweds and to provide a reel of fantastic memories. These interviews are edited into a final, dynamic video that captures the essence of the event. We create a warm, classically romantic atmosphere with elegant touches designed to showcase the traditional classiness of any wedding ceremony across cultures and ethnicities. Seamless Service: Back Office Pro can handle large volumes of work which will be undertaken by skilled wedding professionals including videographers, planners, and video editing businesses. Full-Service Offering: Our team can make use of technical or creative editing to deliver full length, feature, and highlight videos, such as spoilers, introductions, and key moments. Scale-Up Your Services: Partnering with Back Office Pro exposes your clients to our global team’s boundless array of insights and experience to ensure delivery of the highest-quality video outputs. In-house teams can be relieved of the post-processing and editing tasks by Back Office Pro, allowing them to focus on the sensitive production work. Global Portfolio: Our years of experience in editing wedding video footage have resulted in a large portfolio of successful wedding events spanning a multitude of cultures, countries, and ethnicities. Trend Relevance: To stay ahead of the curve and provide a sought-after competitive edge, Back Office Pro maintains familiarity with creative and technical aspects of the emerging trends in social media, online publishing, and presentation technology. Dedicated Resources: If desired by the client, we assign the project to a dedicated team to facilitate ease of communication and the repeatability of the results on a consistent basis. If you are looking for experienced, cost-effective, and productive wedding video editing services, complete the contact form on our website. One of Back Office Pro’s experienced business development managers will get back to you within one business day to begin discussing your project.